This is a splendid early example of Nicholas Visscher's important 1657 map of the Holy Land, or as it is titled (in rough translation) 'Paradise, or the Garden of Eden. With the Countries circumjacent Inhabited by the Patriarchs.' Covers the region between the Mediterranean and the Persian Gulf (including the modern day regions of Israel, Palestine, Jordan Syria, Turkey & Iraq), and features a prominent the Garden of Eden located near the city of Babel ( Babylon ). The beautiful strapwork title along the top of the map is flanked on either side by cartouche scenes from Eden. In the Mediterranean, a sailing ship is being confronted by Jonas's whale. In the lower left quadrant, a decorative scale of miles is topped by an elderly fisherman – one of Visscher's marks. The map itself, combining actual and Biblical geography, is stunningly produced. Features the Land of Nod, the Garden of Eden, the Tower of Babel, and other semi-mythical locations. This map was drawn by Visscher as part of a five part map series for inclusion in Abraham van den Broeck's 1657 Dutch Staten Bible. 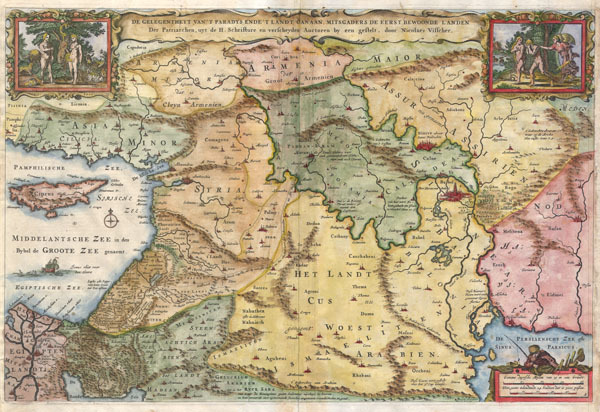 This is the first edition of this important map series which would become basis for numerous other Biblical maps appearing through the 18th century, including those of Stoopendal , Krul and Maxon. Very good condition. Minor margin repair in upper right quadrant. Original centerfold. Else very good. Poortman, Kaarten in Bijbels, #84.